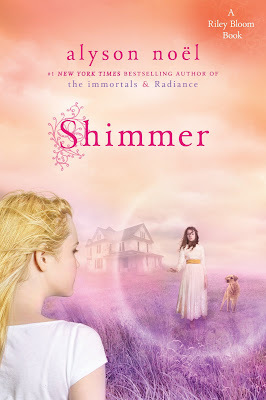 Just got the okay to share the SHIMMER cover with all of you--hope you like it as much as I do! NIGHT STAR Countdown Continued . . .
Just 3 more weeks . . .
Wow, after 5 weeks of pretty much non-stop travel I get to be home for . . . well, for about 5 weeks before it starts all over again. And believe me, my desk is definitely showing the signs of neglect! So while I spend the day trying to get it back into some kind of order, I will leave you with this video I made in the shiny new offices of my UK publisher, Macmillan. The One & Only NIGHT STAR Signing!! Since the NIGHT STAR release date falls so close to the holidays, and since I'm headed off for more book promo in Scandinavia & Paris shortly after, this will be the one and only signing I'll be able to do--so I really, really, really hope to see you there!! So, after weeks and weeks of what pretty much amounted to non-stop, book related travel, I dedicated yesterday to laziness. My one and goal being that I'd fail to accomplish much of anything. I started my day on the couch, drinking coffee and getting all caught up on the first 3 episodes of this season's Bored to Death, but then, it wasn't long before it started to feel like a sick day. And since I wasn't sick, and since I'm really not that great at daytime couch-lounging (I get antsy), my husband and I decided to head out in search of shopping and eating (lots and lots of eating! ), making sure to return home in time to watch episode 4 of Bored to Death along with the latest Dexter, and, while it may not have turned out to be quite the "do absolutely nothing" day I'd envisioned, it was pretty dang great all the same! But today I'm back in business. In fact, I'll be heading to LA this afternoon as tomorrow at O'Dark Hundred I'm scheduled for a full morning of back-to-back interviews for a TV/Radio satellite tour. Basically I'll head for a studio in the early AM (my wake-up call is set for 3:15--yikes! 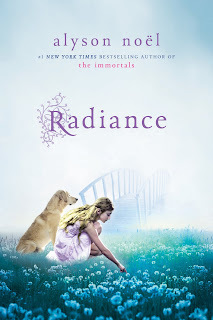 ), where I'll get made-up, miked-up, and lit, so I can chat with various people I can't actually see, answering questions about RADIANCE, Riley, and more, that'll be beamed out all over the nation. 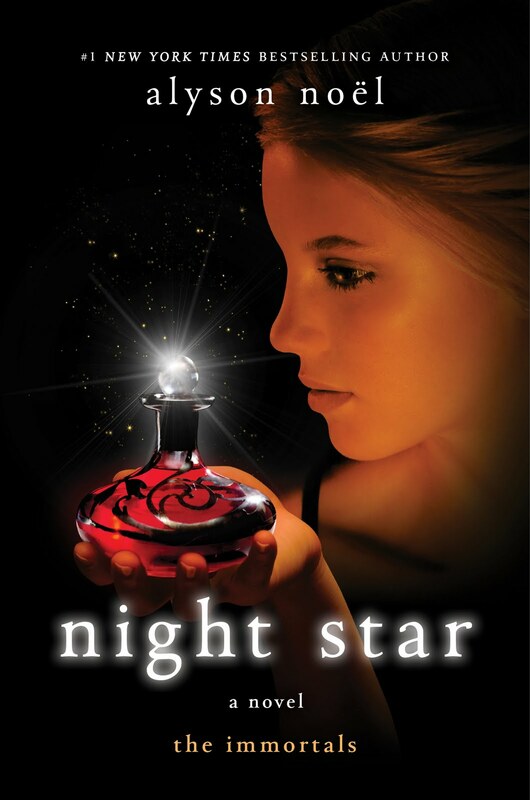 Just one month to go until NIGHT STAR is in stores!! But until then, you can read an excerpt HERE. And to receive a special message from Haven and get a sneak peek at Chapter two, subscribe HERE!! I'm off to Seattle today for the WLMA/WALE conference, but thought I'd leave you with this clip that I did in Frankfurt for a German morning show, ZDF Morgenmagazin. Just click HERE to see it (I'm at the 3.13 minute mark!)! Also, subscribers to THE IMMORTALS site will be sent a special message from Haven and get a sneak peek at chapter two of NIGHT STAR (in stores 11.16.10)! Subscribe HERE! If you follow me on Twitter you probably already saw this, but if not, then let me just say that yesterday was one of the best mail days ever! Partly because THE IMMORTALS boxed set arrived!! Which just so happens to come with a super gorgeous poster that is definitely destined for a spot on my office wall just as soon as I can get it framed! And partly because my awesome editor sent me a hot-off-the-press copy of NIGHT STAR. After all these books (13 published and 2 in production!) that first glimpse of the latest release never gets old! Also, just wanted to shout out a big, glittery THANKS to my Danish readers for making SHADOWLAND debut at #2 on your bestsellers list!! I will be headed your way on November 24th (details coming soon! )- and am really looking forward to meeting all of you! And speaking of Denmark, I just leaned that Riley's series will be translated there as well--I'm so excited about that and I really hope you all enjoy reading it as much as I enjoyed writing it! And, last but not least, tomorrow I'm headed for Seattle for the WLMA/WALE conference where I'm giving a presentation on writing for teens as well as a breakfast keynote speech on Saturday morning, and I'm really looking forward to it! And now, I'll leave you with more photos from Frankfurt (courtesy of my Bulgarian publisher-Softpress)! My Taiwanese & Bulgarian publishers! My Bulgarian publisher & me- their cover for EVERMORE is gorgeous! Still jet-lagged--still tackling laundry--still playing catch-up on the blog . . .but just wanted to let you know that as of today, The IMMORTALS boxed set is in stores!! Yep, the trade paperback versions of EVERMORE, BLUE MOON, & SHADOWLAND can now be purchased as a really cool boxed set--and from what I hear, there's a really beautiful poster that goes with it as well! Also, for those of you who subscribe to THE IMMORTALS website, be on the look out for a special message from Haven that should be coming your way very soon . . .
Oh, and in case you missed it--a free Alyson Noel app is now available for download!! Keep up on signings, news, and get excerpts--it all happens HERE!!! And now, on to the pictures . . . Speaking to the students at Ricards--it's like a sea of purple blazers! These students were so incredibly sweet! Did 10 back-to-back radio interviews--looked daunting on paper but turned out to be fun! Speaking of daunting . . .signed 500 copies of DARK FLAME at the WH Smith headquarters in Swindon! 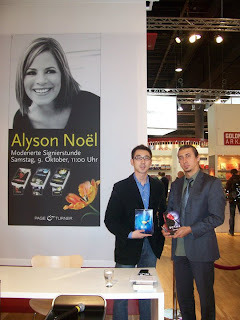 With a German reader, Lauriel, at the Kaufhof signing--her English was better than mine! That's it for now . . . have a great day, everyone! A lot has happened in the last 10 days, and since I just got home and am a wee bit jet lagged, I figured I'd let the pictures do the talking if it's okay with you. But first, I'd like to shout out a big sparkly THANKS to my awesome UK & German publishers (Macmillan & Random House respectively) for showing me such a wonderful time and for taking such good care of me on my travels abroad. And another big sparkly THANKS to all the lovely readers who showed up at my signings, including the students of Ricards school in England--you were such a wonderful audience--and your purple blazers were amazing! 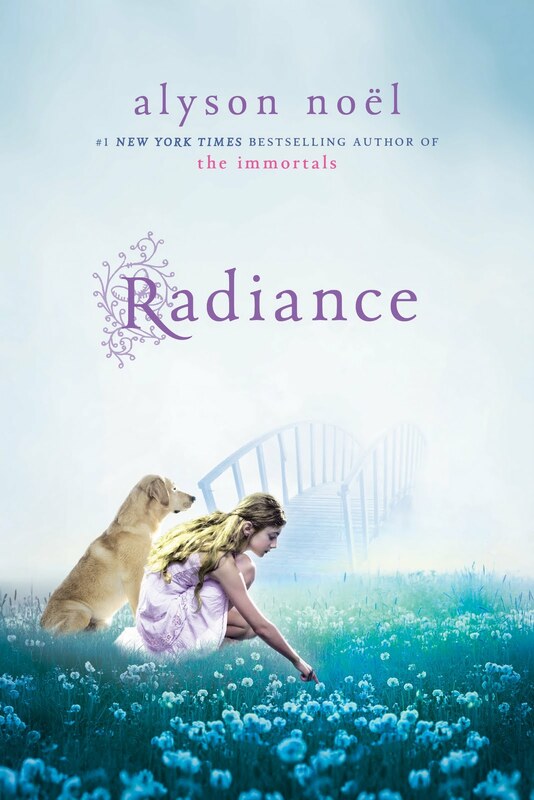 Also, while I was away, I learned that RADIANCE stayed on the NYT Bestsellers list for its 5th week in a row--so THANK YOU you for that! And now for the pics . . .
On the flight to London--Virgin Atlantic ROCKS! At the Frankfurt Book Fair being interviewed for ZDF Morgenmagazin! With the ZDF Morgenmagazin host, Peter! Sarka, Olivia, me, Christiana, & Jessi--the lovely winners of the Buchjournal contest. We had an awesome time hanging out together, and Olivia gave me some amazing EVERMORE art that I plan to post as soon as my scanner is back in working order! With a lovely group of readers at the Kaufhof signing! Another lovely reader at the Kaufhof signing! That's all for now--have a great day, everyone!! Alyson Noel App Now Available! 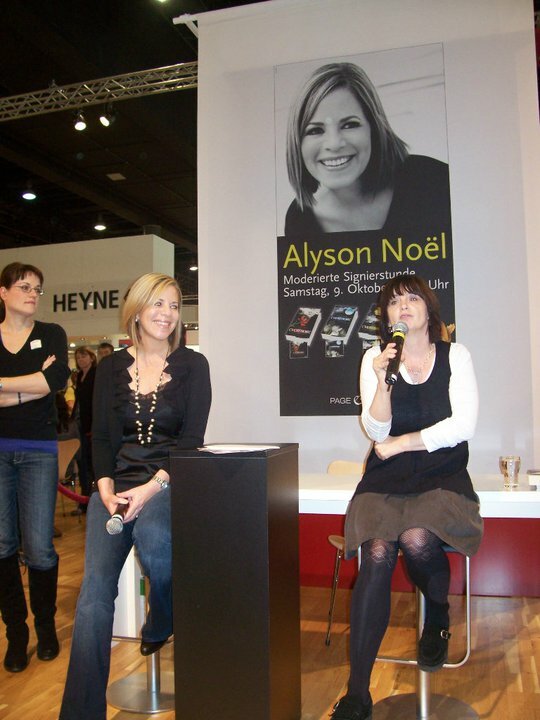 Taking time out from the crazy/busy Frankfurt Book Fair to tell you about the brand-spanking-new Alyson Noel App now available for free download HERE!!! Hope you enjoy it!